Sure, we deliver effective, dynamic websites, powerful email marketing programmes and Focussed social media management but we recognise these are the means, not the end. Marketing is about meeting business objectives. BSA helps you do this by using great, cost-effective tools and a consistent approach joined-up marketing. 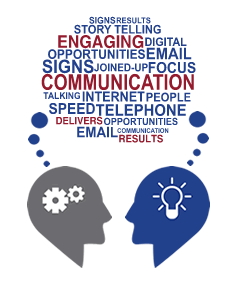 Sometimes it’s not as simple as email newsletters, a new website or a social media campaign. You may know you want develop your marketing, and you like what we say, but you aren’t sure where to start. We are always happy to sit down with you and talk through the options over a cup of coffee. From these discussions we can normally identify a way forward to developing a sustainable, joined-up marketing programme. It may be that you then wish to take these ideas forward yourself, or if we can help in delivering your marketing, we will put together a proposal as to how we can move forward together. If you don’t keep in touch with existing contacts, what will happen to new contacts? Should you focus on building lists or doing something with your contacts? If you know you want to do something, but aren’t sure where to start, get it touch, it costs nothing to talk.